Located on the very busy neighbourhood of Taramani where major junctions of Sardar Patel Road, Adyar and Rajiv Gandhi Salai lie the Madhya Kailash Temple lies in close proximity of the IIT, Chennai. This temple is home to the deity Venkata Ananda Vinayakar who is also considered the “Moolavar” or main deity of this temple. Along with this deity the temple aslo has shrines of Lord Siva, Surya, Devi and Vishnu. This Chennai attraction is also popular for its Lord Ganesh idol of “Adhyantha Prabhu”. How popular is Madhya Kailash Temple? People normally also visit Sri Maha Prathyangira Devi while planning their trip to Madhya Kailash Temple. Temple is nice and the ambience there is lovely. Good place to bring friends and family. Only parking is a bit difficult. You'll need to park somewhere nearby and walk it up to the temple as it is situated on a main road. If that isn't a problem then you should definitely visit this place. 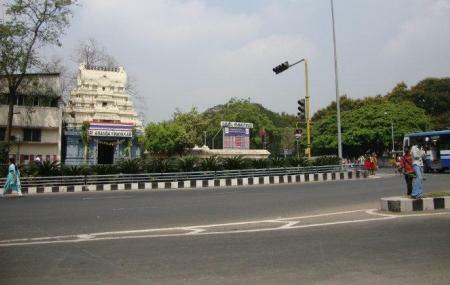 One of famous temple known for it's heavy traffic which accumulates in this signal. The temple is well known for giving thithi for the passed away ancestors. It's pretty small temple where u can see couple gods in that small given space. Nostalgic place.. brings back old memories whenever I cross this beautiful temple.. even more beautiful was the huge tree adjacent to the temple premises-which used to be an icon for so many years.. pity, it was cut down as there was no sign of life in it.. however the temple offers its deities the peace of mind they are searching for and it will continue to be one of the famous cultural landmarks of Chennai city! Centrally located and easily accessible from bus stop and by car. Road side parking is available. Slippers have to be kept near the temple entrance and there is nobody to take care. New pairs will get lost very easily and you can never spot anyone to question particularly at night times.